I understand what you're saying about Fender being an eViL cOrPoRaTiOn and everything, but they've used Staytrem components on their guitars before, haven't they? Or at least borrowed their ideas. It wouldn't cost Fender much to produce a similar bridge (or exact if they obtained their schematics) and they would definitely make money on it... there's definitely a market. If Mastery can sustain itself purely based on bridge and tremolo sales, then why wouldn't Fender want a cut of that, especially with offsets being increasingly popular? The Mastery has been around for a decade, if Fender wanted to invest in a competing bridge design, they would have. Most offset buyers don't change the bridge - either they live with the difficulties or they have someone set it up to work or whatever. Gimme a few months. It's on my to-do list. Not kidding. I'm seriously thinking about doing this for a part time cottage industry hobby. It would definitely fulfill a need. Even if it's a small one. Mastery is just too expensive and to some have left a lot to be desired. They also suffer from conversion issues by not allowing for TOM drop in/thimble replacements like staytrem had. Sure. I'm thinking that, for a start, I'd make saddles to replace what comes on a stock fender offset bridge. They'd be in 7.25 or 9.5 radii, and I don't suppose it would be any harder for me to make them from two things than from one, so I'd probably offer them in stainless and brass. And I'd probably come up with some kind of sleeve to keep the bridge from rocking, for people who want that. And something so people can do whatever conversion they need to do if they choose to go that way. I've been thinking about non-cylindrical saddles and how I might do that, but I'm not gonna let myself get too far ahead yet. I am interested in making good, solid saddles that anyone can drop in, first and foremost. Yeah, I can get behind those ideas all day long. Now would be prime time for anyone looking into getting an alternative to Mastery out there. I have two Masterys and they really weren't worth what I paid. To be fair, the original bridge on my stock 66' Jag functioned just as good or better. The first mastery I bought was from hype that I read on here for a squire jaguar. To be honest, the thing played worse after that bridge was added, granted the tech that I took it to at the time was questionable and I think cranked the truss rod too much and damaged my neck. Either way, the bridge wasn't easy to set up and after the installation my guitar had problems it never had. The second mastery I bought was out of necessity as the string spacing on my original Johnny Marr bridge was too wide. It did fix that problem, but I would've been fine with a correctly spaced Marr bridge. Hindsite I would've went staytrem to save money. As I feel the mastery Is definitely not better (probably worse) and definitely not worth the premium they charge. While the vintage bridge works well, it isn't without problems. I think most of us offset users simply want one thing. That thing is a stable bridge that will not require constant adjustment. Mastery supplies it now, but I'm betting anyone with the desire can come along and put the pressure on them. It's just a guitar bridge after all. Also, in regards to Larry's comments..He's right. Fender are the real bad guys here. They could make it cheaper than anyone, but they don't care about making good guitars. I've got a Fender Mustang Bridge on my AV65 JM, the Stock Bridge on my AV65 Jag & a Fender Mustang Bridge on my Squier JMJM.. No problems with any of them.. No String jumping issues with any of my Offsets... I do use the Std. Gauge size Strings that each Guitar comes with.. I do agree about Fender & Squier having QC issues lately though..... They can easily clean up their Act... Adopt the philosophy of an old saying & expect it out of every Employee.. "Do it once, Do it Right".. If reports of 52mm spacing on the new LPB Marr are true then Fender effectively almost has a Staytrem - correct spacing plus the anti-sink post-bushings (as on the original Marr). Nylon washers in place of springs, and the offset intonation screws would be nice too, but less important. Problem is it's not available aftermarket AFAIK. And the Am Pro Mustang bridge has 9.5 radius, and the anti-rocking bushings. A question for Staytrem owners ... are the nylon washers just that - unthreaded washers - or are they threaded ? Also, are they attached (glued ?) to the back wall of the bridge or not ? They do look to be a tight fit (to stop the screws rattling) .. so maybe M2.5 washers on M3 intonation screws (effectively force-threaded / self-tapped) ? I haven't actually dissected them, but mine seem to just be lil grey nylon o rings sitting on there tight. I'd say 2.5 on an M3 is a good guess. Man, these look fantastic! I think this is an amazing concept that could essentially resolve the issue if we could collectively figure out how to source them and the other plastic/nylon bushings and washers necessary to replicate the Staytrem in a cost efficient manner! Bravo ThePearDream! Thanks! I thought that if the 3d prints turn out okay, I would just make them available on my Shapeways shop without any upcharge. I'm not interested in getting into the aftermarket bridge business. I'm just a bit of an inventor at heart and would rather spend my time on the next idea than the last one. That said, these will be more expensive than I'd like. The 2nd type would be around $43, though they could probably also be made from 3/16" flat bar stock with a drill press and basic hand tools. But, again, I'm not going to spend my free time doing that to make thousands of saddles. This does seem worthwhile. When you say foul the string, do you mean run into the string? Haven’t found a source for these just yet, but I’m sure they can be found with the correct measurements of the aftermarket bridge. Also, the flanged nylon bushings in the top of the thimbles (#2 above) would have the same desired effect of rendering the bridge as non-rocking. ....I hope Jess Loureiro doesn’t catch wind of this! 5. Using hex drive, button head stainless steel intonation screws. I believe M3x16 for import and 4/40x5/8" for US will work. I do this on my bridges now. It makes intonation way easier. I've tried to use nylon washers on an import bridge before, with limited success (rattling, etc.). On the Fender bridges, the walls of the bridge base are slightly angled, making it hard to get a tight fit. The Staytrem bridge base has walls that are more vertical (probably milled from a u channel or hollow square tube stock), allowing for the tight fit of the washers. One could bend the wall slightly on a fender bridge, but it would be hard to get it exact, and a lot of people will scratch up the surface. So, in theory would it work to dowel the bridge posts on a mascis and then redrill for the American Pro? The Am Pro bridge still has 56mm spacing, which has been an issue for some owners. I was just making the point that Fender already has some Staytrem-like options, albeit across several bridges - I believe the Am Pro is the only Mustang-style bridge they've done with a 9.5 radius. Dowelling and redrilling a JMJM for that bridge would probably be a risky venture. I've been thinking we should have a thread where we bounce ideas around and consolidate all of the scattered knowledge to come up with some alternatives. I'll start. 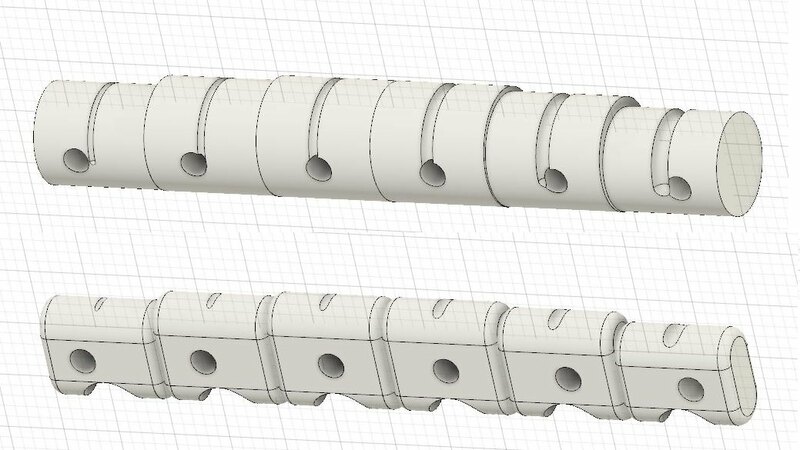 3D printed saddles that use import bridge screw spacing, but are designed for 52mm string spacing and 9.5" radius. The string slot and screws get a slight offset helping to alleviate the screw fouling the string. After printing, they would just need to be tapped for the screws. I have a set of the 1st type being printed now. Then, I realized there was no reason for the saddles to be round, so I drew up the second version to lower the cost and give greater range for intonation.